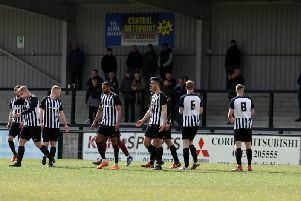 Tommy Wright was full of frustration again after Corby Town slipped closer to the Vanarama National League North trapdoor. The rock-bottom Steelmen were beaten 4-1 at leaders Solihull Moors on Easter Monday, a defeat that leaves them seven points adrift of safety with just six games to play. Corby fought back from falling a goal down early on with Ben Milnes equalising with a fine long-range strike. Boss Wright was disappointed to see his team concede three of their four goals from set-pieces. But, despite the scoreline, he felt his team had performed as well as they have done for a while. And while the situation is looking desperate, he insists no-one at Steel Park will be giving up on the survival bid. “We conceded four poor goals, three from set-plays,” Wright said. “It’s hard because I don’t want to over-criticise the lads. It’s probably the best we have played in a long time and that sounds stupid because we have lost 4-1. “We have gone toe-to-toe with the leaders and matched them for long spells but we have let ourselves down from three set-pieces and conceded the other from a penalty. “It’s frustrating. It’s a tough league and I think the thing that showed itself the most was the strength in depth Solihull had. “They had some very, very good players on the bench and when you see that you just realise what level you are at. “I think we are good enough to be in this league but we have not performed at key moments and it is costing us dearly. “I am not going to give in, we will keep plugging away. “We have got back-to-back home games coming up and I want the lads to go and play football like they did at Solihull. “If we are going to go down, I want us to go down by the smallest possible margin. I want us to give it a right go. Wright sprung a surprise on the team sheet as he included striker Callum Ball in his starting line-up. Ball had a spell with the club earlier in the season before leaving but he is now back and Wright was impressed with what he saw. “Callum’s name came up in a conversation I was having a few weeks ago,” the Corby boss added. “He was one that we were looking at to come back in pre-season. I admire him as a footballer and he probably wasn’t fit enough when he was with us before. “I was only on the pitch for 20 minutes on Saturday (in the 0-0 draw against Hednesford Town) but I thought it gave us an added dimension so we thought rather than Callum coming back in the summer, we would get him back now.